In weather or climate science, a teleconnection is a strong correlation between variables located at distances much greater than usual: for example, thousands of kilometers. Teleconnections typically indicate important weather or climate phenomena. An excellent example is the negative correlation between sea-level air pressures at Tahiti and Darwin, Australia, which illustrates the large-scale nature of the El Niño / Southern Oscillation or ENSO. The first graph below shows the air pressure at Tahiti minus that at Darwin, together with a 3-month running average. This quantity is called the Southern Oscillation Index or SOI: it is positive during a La Niña, and negative during an El Niño. 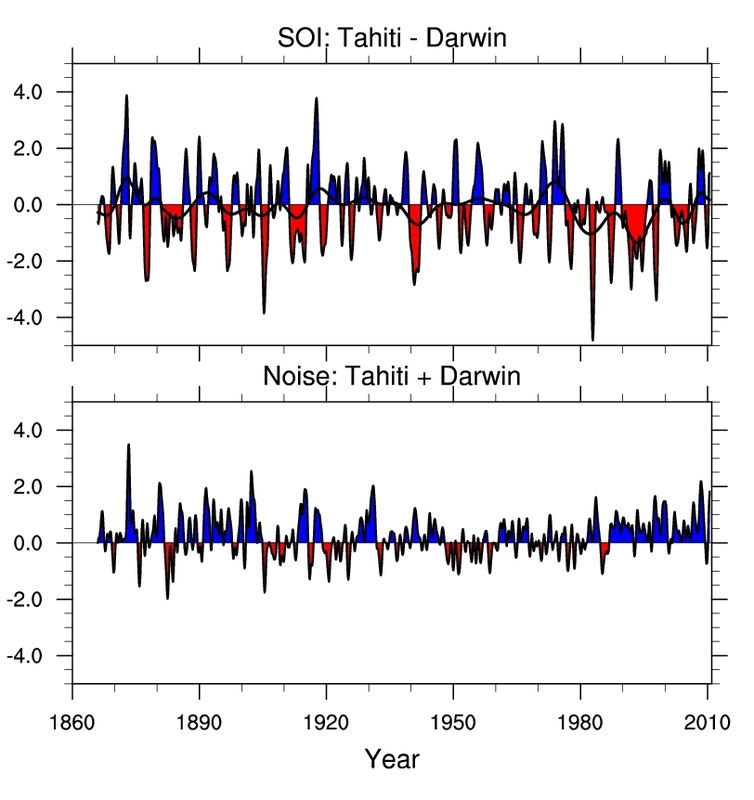 The second graph shows the air pressure at Tahiti plus that at Darwin; this is essentially random noise. For an explanation of why the air pressures at these two locations are so negatively correlated, see ENSO. Linear projection (LP) and nonlinear projection (NLP) of the ENSO index onto 4 different winter N. Hemisphere atmospheric anomaly fields, with the LP displayed in panels (a) and (c), and NLP in (b) and (d). The SLP (contoured) and SAT (colored) anomaly fields are shown in (a) and (b), while the Z500 (contoured) and the standardized PRCP (colored) anomaly fields are displayed in (c) and (d), all evolving as the ENSO index (shown on the far right) swings from extreme negative values (cold ENSO conditions) to extreme positive values (warm ENSO). Positive and negative SLP and Z500 anomalies are indicated by solid and dashed contours respectively, with the zero contour thickened. William W. Hsieh, Aiming Wu and Amir Shabbar, Nonlinear atmospheric teleconnections, 2005, Geophy. Research Letter, 33 (2006), L07714. Abstract: Nonlinear atmospheric teleconnections, found to be related quadratically to the El Niño Southern Oscillation and Arctic Oscillation indices, propagate perturbations into areas where classical linear teleconnections are insignificant. Ren et al., A kinematic mechanism for positive feedback between synoptic eddies in NAO. Abstract: A kinematic mechanism for the positive feedback between the North Atlantic Oscillation (NAO) and synoptic eddies are depicted based on observational data analyses. Using three-point rescaled covariance statistics of bandpass-filtered (2–8 days) synoptic eddy fields, we examined observed eddy structure changes associated with winter mean NAO anomalous flow. It is demonstrated that the NAO flow anomalies systematically deform the structures of recurring synoptic eddies to generate seasonal-mean eddy vorticity flux anomalies predominately directed to the left hand side of the NAO flow anomalies. These anomalous eddy-vorticity fluxes converge into the cyclonic center and diverge from the anticyclonic center of the anomalous NAO flow, and thus enhance the NAO flow. Sergey Kravtsov, Dmitri Kondrashov and Michael Ghil, Empirical model reduction and the modelling hierarchy in climate dynamics and the geosciences, in Stochastic Physics and Climate Modelling, eds. Tim Palmer and Paul Williams, Cambridge University Press, Cambridge, 2010, pp. 35-72.